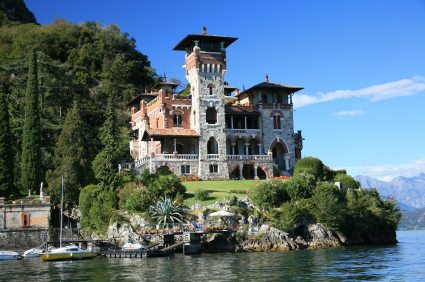 Towards the end of Casino Royale, James Bond tracks Mr White down to a villa on the shores of an Italian lake. Bond calls Mr White’s phone. When he asks who is calling Bond shoots him in the leg. Mr White hits the floor and Bond steps into the frame. 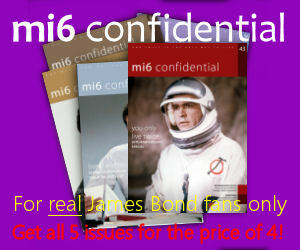 “The name’s Bond… James Bond”, he answers as the James Bond Theme blasts out. And – at the London premiere at least – the audience cheer. This scene was shot at Villa Gaeta on the shore of Lake Como in Italy. The villa is divided into apartments available for holiday lets, which means this unique property is available to James Bond fans for short-term rental. During the low season a single-bedroom apartment can be rented for just four days, although the high season rental period is a week – click here for more information on renting Villa Gaeta. The villa was built for the industrialist Ambrosoli and its style is an eclectic mix of styles; designed by architects Gino and Adolfo Coppedè in 1921 its mediaeval inspired turret combined with renaissance and Art Nouveau details isn’t to everyone’s taste. Gino Coppedè (1886-1927) is best known for his work in the Quartiere Coppedè in the district if Trieste in Rome. He was commissioned to design some 40 buildings or so in a newly developed area of the city and like Villa Gaeta the designs show a variety of architectural styles through interpreted through Art Nouveau. Work on the Quartiere Coppedè started in 1913 and was largely completed by 1921 after construction stopped during the First World War. Unfortunately Coppedè died before the project was entirely completed; his son, Paolo Emilio André, was responsible for its completion. Villa Gaeta has its own private beach which makes swimming in the lake ideal and it is remote enough for you to require a car; if you’re a golfer you’ll be happy to learn that the Menaggio course is just ten minutes away, while skiers will find a variety of slopes within driving distance both in Italy and across the border in Switzerland. Milan is around 60 miles away, which makes it ideal to fly in and out of as well as being within driving distance for sightseeing. Apart from its reputation for design and fashion, Milan is famous as a tourist destination. Among its many attractions are Milan’s famous gothic cathedral, the Duermo, which took six centuries to complete and is one of the largest in the world. Leonardo da Vinci’s The Last Supper is also in Milan, at the monastery of Santa Maria delle Grazie. Much closer to home are the Menaggio Lido, where you can enjoy the private beach and pool for a small fee during the day. It has a restaurant and on Friday and Saturday nights the banqueting hall and lakeside gardens become a nightclub. Also nearby is the picturesque town of Bellagio, which is located on the junction of the three branches of Y-shaped lake Como. You can take the ferry from Menaggio to Bellagio, which takes 20 to 30 minutes and runs several time per hour. An adult single costs just €3.70, while a one day pass is €12.00. 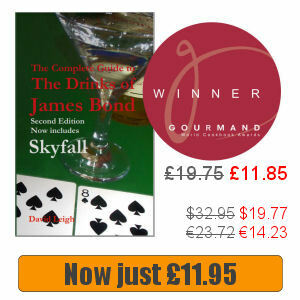 Or learn more about Casino Royale and the filming locations.